The rise of tablets and smartphones may be contributing to the decline of the PC market as a whole. But for years now, Apple’s Mac lineup has continued to flourish. If you look at the long-term trends of Apple’s quarterly numbers, unit sales of the company’s desktops and laptops grew steadily year by year over the past decade—every year, that is, until the end of 2012. The most recent numbers indicate that the Mac, like other PCs, is finally feeling the impact of the so-called tablet revolution. In 2003, Apple shipped just over 3 million Macs worldwide, most of them desktops, and they accounted for more than 72 percent of Apple’s overall revenue. Jump ahead to Apple’s 2011-2012 financial year (FY12), when the company sold more than 18 million Macs: Mac sales then accounted for less than 15 percent of Apple’s bottom line. Apple sold more Macs every year than the year before, until 2013. How does that happen? The biggest shift in Apple’s business, of course, was the advent of iOS. Beginning with the iPhone in 2007 and followed by the iPad three years later, Apple set off a tectonic shift in personal computing—a change that is still wreaking havoc on the entire PC market as well as on Apple itself. How big is that shift? For the five years leading up to and including 2008, the year when iPhone sales really took off, Macs averaged 27 percent in unit-sales growth every year. During the five-year period from 2009 through 2013, the average yearly unit-sales growth was 10 percent. Analysts are still debating whether mobile devices are outright replacing the computer or whether they’ve just slowed down the PC-replacement cycle. In either case, people are buying fewer Macs than they once did. But Macs are still doing better than the PC market generally. There are three reasons for that continued relative success. First, Apple’s own retail stores gave the company more direct communication with Mac buyers and let the customers get hands-on time with the company’s products. “Direct retail is one of the big success factors for Apple,” says Mikako Kitagawa, principal research analyst for market research firm Gartner. Third, demand for notebooks began to regularly exceed sales of desktop machines. In 2004, laptop and desktop Mac sales were roughly equal. Starting in 2006, however, laptops began to outstrip desktops to the point that, in 2013, they outsold them by three to one. With a strong showing in 2012, the popularity of Apple’s Mac appeared set to increase. New product announcements combined with the company’s most recent financial results, however, shed some doubt on that proposition. But then, after selling more than 18.1 million Macs in 2012, Apple sold just 16.3 million during its 2013 financial year—a decline of nearly 10 percent year over year. 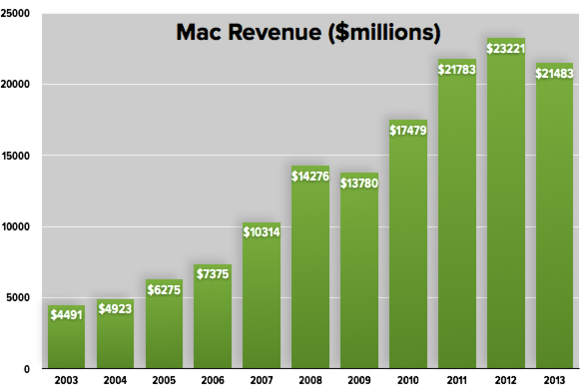 Revenues from Macs rose every year since 2003, except for 2009 and 2013. It’ll be interesting to see what will happen to those numbers in the new fiscal year. The company is set to introduce the new Mac Pro—the first refresh of that product line in years. Its three other product lines (MacBook Air, MacBook Pro, and iMac) have seen only incremental improvements in the past year or two; they’re all poised for a more dramatic overhaul. 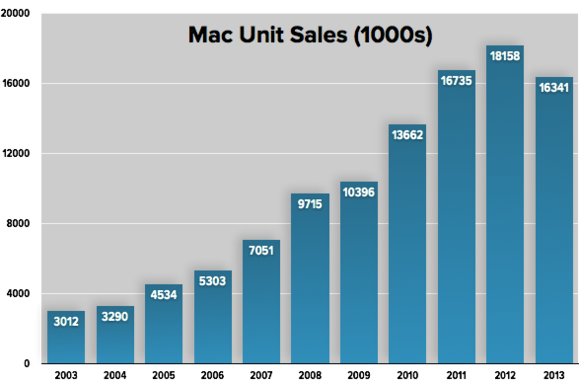 The lack of truly new Macs in 2013 could be all that’s needed to explain the decline in sales. But there could be other reasons for that decline, reasons that could spell a darker future for the Mac. For one thing, Apple appears to be working harder than ever to make good on Steve Jobs’s prediction that PCs will become tools only for the “truck” drivers among us. The recently released iPad Air, which is 20 percent thinner and 28 percent lighter than the previous model, has a desktop-class A7 processor that is powerful enough to outperform 2010-era MacBook Air devices in benchmark tests. The iPad Air’s portability, combined with its upgraded processing power, could mean a more viable replacement for many current laptop users than previous iPads. The company also introduced a new version of iWork that strips many power-user features from the OS X version to create a productivity suite that works equally well across Macs and iOS devices. In the face of user outcry, the company promised to reinstate some of the missing features in future versions. But the unification of the laptop and tablet experience seems to be inevitable. Instead of catering to the Mac, Apple appears focused on creating platform parity, so users can be as productive on an iPad as they are on the Mac. Nevertheless, when you combine a PC market in retreat, the expanding functionality of the iPad, and Apple’s minimum $1000 price tag for the MacBook, it seems likely that we’ll see more dramatic declines for the Mac in favor of iOS devices. Yet even with diminishing prominence, MacBooks and iMacs still have an important role to play in Apple’s overall business. 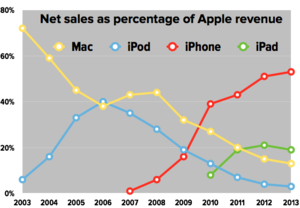 Macs play a declining, but still important, role in Apple’s overall business. Along with Samsung and Lenovo, Apple is at the forefront of the so-called post-PC era. Instead of relying on a desktop or laptop for everything, smartphones, laptops, and PCs are playing complementary roles in our everyday lives. Each device now suits specific situations from crunching massive spreadsheets at the office to catching up on reading into the wee hours before dozing off. Looking into the distant future, it’s anybody’s guess what’s in store for Apple’s desktops and laptops. Will the Mac and iPad remain separate, or will the the two converge into a single device? Anything’s possible. But given Microsoft’s struggles to create a world of tablets, laptops, and desktops all running Windows 8 and 8.1, Apple’s steady approach to the Mac’s evolution seems like the right course.